This Guide focuses on illustrating how to free download and convert YouTube (HD) videos for playback on Samsung Galaxy Note 4/Note Edge, and is also fit for other Samsung products like Samsung Galaxy Note 8 and S8. In early September 2014, smartphone giant Samsung came out with its long-awaited Samsung Galaxy Note 4 and the novel Samsung Galaxy Note Edge. Galaxy Note 4 features a 5.7 inches quad HD AMOLED display, a 16MP rear-facing camera, a 3.7MP front-facing camera and an improved fingerprint scanner as well as S Pen. Aside from replicated features of Note 4, Galaxy Note Edge also comes with a curved screen edge which lets users quickly access to frequently-used apps and alerts without interrupting other operations. Both handsets with huge and HD display are preferred devices to play videos. 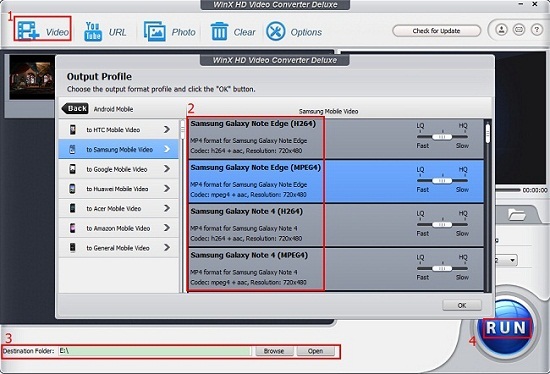 Users can play the videos compatible with Note 4 and Note Edge, such as MP4 videos, WMV videos. However, both Note 4 and Note Edge have limited supported file formats. As the result of such limitation, users cannot directly play some YouTube videos on Samsung Galaxy Note 4/Note Edge, like YouTube videos in FLV and WebM in standard and high definition resolution. Play YTB Video on Note 4, Note Edge, Note 8, etc? Free download any videos from YouTube directly. Download and convert YouTube videos to Galaxy Note 4/Edge. How to Free Download YouTube (HD) Videos to Samsung Galaxy Note 4/Edge or Others? Firstly, download WinX HD Video Converter Deluxe (or HD Video Converter for Mac), and then install and double click the app icon to launch it. Step 1. Click "YouTube URL" to add URL of the YouTube video that is ready for downloading. Step 2. "Paste and Analyze" the URL, and then choose an output option (MP4 is recommended if you want to play the YouTube video on Samsung Galaxy Note 4/Note Edge). Tips: If you only want to download YouTube videos to Galaxy Note 4/Note Edge, please uncheck "Auto convert". But if you need the downloaded YouTube videos more compatible with Galaxy Note 4/Note Edge, or other popular devices like iPhone, iPad, HTC, Sony PSP, Xbox, please make "Auto convert" selected. And then you'll be directed to YouTube video conversion. Step 3. Hit "RUN" to begin downloading YouTube (HD) videos for Samsung Galaxy Note 4 and Note Edge. Thanks to the advanced YouTube Video Download Engine, videos can be successfully downloaded at super fast speed. If you have other YouTube videos cannot be played on Galaxy Note 4/Note Edge, please move to the next section – convert YouTube videos to Samsung Galaxy Note 4/Note Edge. How to Convert YouTube (HD) Videos to Samsung Galaxy Note 4/Note Edge, Note 8/S8, or Others? Users are not required to set complicated parameters when using this WinX HD Video Converter Deluxe. Built in hundreds of preset device profiles, it allows users to directly convert YouTube videos to Samsung Galaxy Note 4, Note Edge, Note 8, Note 5, Galaxy S8/S7/S6/S5, Google Nexus, Kindle Fire, HTC One M8, WP8, Blackberry, and more. It is able to fast deliver output file with perfect video audio effect owing to High Quality Engine, De-interlacing Engine and support for multi-core CPU. Step 1. Hit "Video" to load YouTube video for converting. Step 2. Specify an output profile. Step 3. Click "Browse" to save the converted video. Step 4. Click "RUN" to convert YouTube video for Samsung Galaxy Note Edge/Note 4. After finishing converting, please transfer the videos to the Samsung smartphone and then you can freely play YouTube videos on Samsung Galaxy Note 4 and Note Edge whenever and wherever possible. Get this all-in-one YouTube downloader and converter to watch popular YouTube videos on Samsung Galaxy Note Edge/Note 4, say, top 10 YouTube videos, The Tonight Show, YouTube cartoons and funny YouTube animal videos. 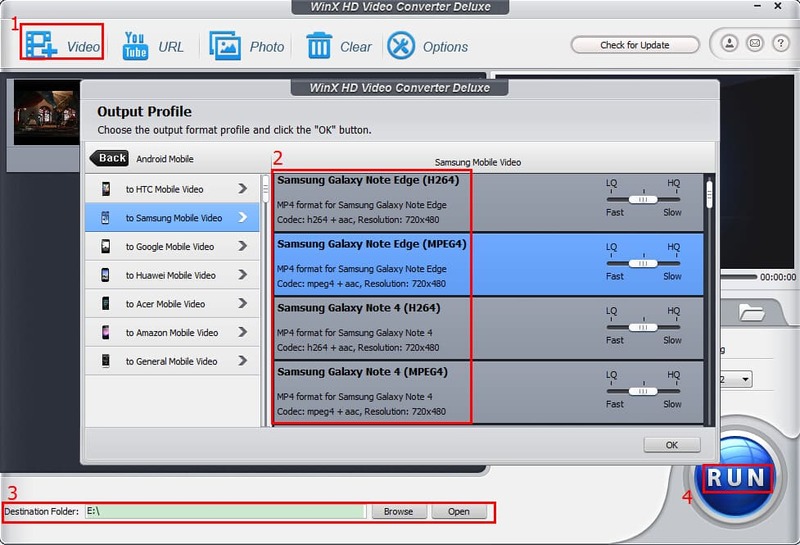 If you need to free download and play YouTube videos on your Samsung Galaxy Note 4/Note Edge/5/7/8, S8/7/6/5, iPhone X/8/7/6S/6/Plus, PSP, PS3, PS4, Xbox, Surface Pro, and more, please turn to WinX HD Video Converter Deluxe.